, an eminent printer, was born at Mont-Louis, near Tours, in 1514. He was instructed in his art at Caen, under Robert Mace, whence he went to Antwerp, and formed by degrees one of the greatest establishments for printing in Europe, and said indeed to be unique in its kind. The whole was upon the most magnificent scale, and even the building was accounted one of the ornaments of the city of Antwerp, and was so amply furnished with presses, founts of letter of all sorts, a foundery, and other matters necessary for the concern, as to have cost an immense sum of money. One of his biographers informs us that Plantin’s ideas were so magnificent as that he cast some founts in silver, and considered himself as having in.that respect done what no other printer had attempted but this is a mistake, as Robert Stephens had before indulged himself in the luxury of silver types, although not so rich a man as Plantin. In 1576 Thuanus paid a visit to Plantin, who, although not now in such good circumstances, still had seventeen presses at work, and the wages of his workmen amounted to 20O florins per day. But what redounds most to his credit was | the number of men of learning whom he retained in his service, and rewarded with great liberality for their assistance in correcting the press. Among these were Victor Giselin; Theodore Pulman; Antony Gesdal; Francis Hardouin Cornelius Kilien and Francis Raphelengius, who became his son-in-law. Cornelius Kilien, one of the most learned and accurate of these, spent fifty years in this printing-house. 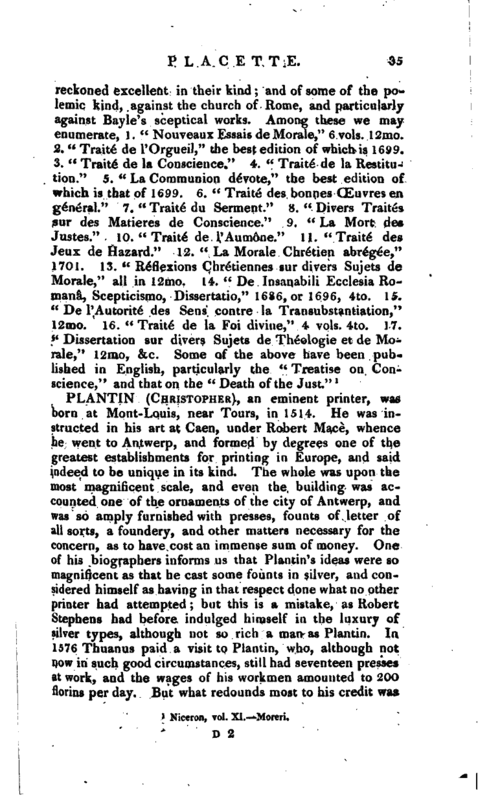 The correctness, therefore, of Plantin’s editions, with such aid, is not much a matter of surprise, and will appear still less so when it is added that he was so fastidious as not altogether to trust to the assistants now mentioned, nor even to rely on his own skill and knowledge, both of which were great, but used also to hang up the proof sheets, after undergoing every possible degree of correction, in some conspicuous place, promising rewards for the detection of errors. In this, likewise, it will be observed, he followed the example of Robert Stephens. 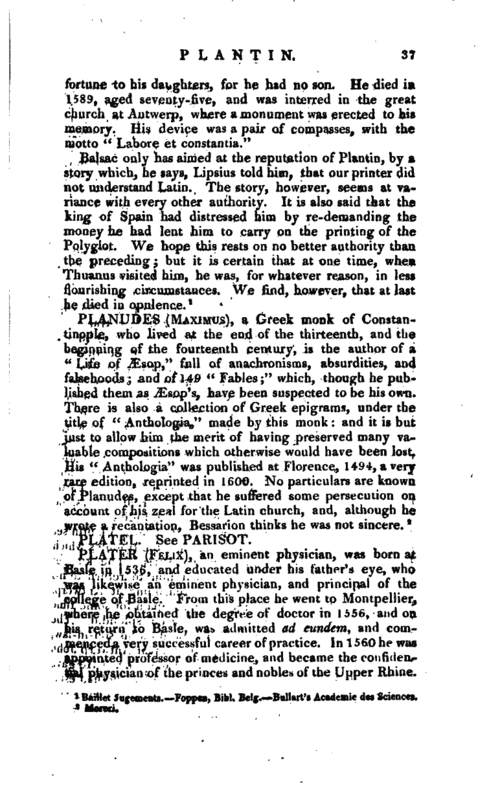 Such care on the part of Plantin, with the beauty of his types, and the judicious choice he made of the authors to be printed, gave him very high reputation among the learned of Europe, who are unbounded in their praises of him, particularly Lipsius, Scaliger, Antonio, Baronius, and Arias Montanus, who expatiates on his merits in the introduction to what may be termed Plantin’s capital work, the Antwerp Polyglot. 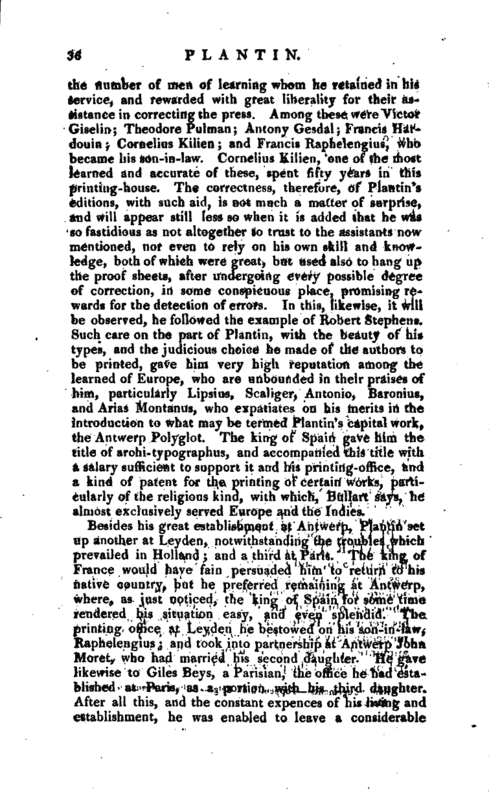 The king of Spain gave him the title of archi-typographus, and accompanied this title with a salary sufficient to support it and his printing-office, and a kind of patent for the printing of certain works, particularly of the religious kind, with which, Bullart says, he almost exclusively served Europe and the Indies.